Eric Hosmer earned his salary Sunday when he stepped up to the plate at the bottom of the fifth inning. With the pitch count at 3-1, he slugged the ball deep center for a two-run home run that put the San Diego Padres up 2-0. 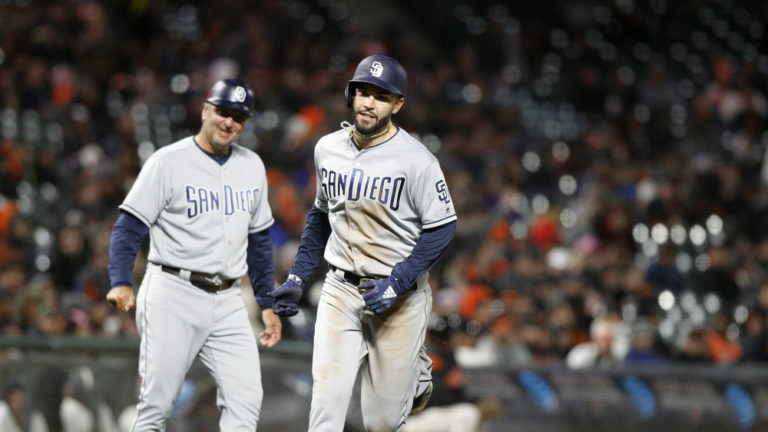 The homer was Hosmer’s fifth this season and it was enough to propel the Padres to shut out the Los Angeles Dodgers 3-0 at Estadio de Beisbol in Monterrey, Mexico. The Mexico Series, part of Major League Baseball’s expansion plan, was considered a home game for the Padres. Hosmer also had a two-run homer Saturday in the 7-4 win against the Dodgers. The first baseman is on a hot streak. During the past two weeks, he’s reached base in 26 of his 46 at-bats. Sunday’s dinger was Hosman’s third in the past five games. Padres prospect Eric Lauer, who has been winless in two starts with a 10.13 ERA, picked up his first MLB win after pitching six shutout innings. It wasn’t easy for Lauer though, he gave up seven runs and had runners on base in every inning. But he was able to find ways to strand them every time. The win was the first series win and the first back-to-back win for the Padres since taking three in a row from the Giants on April 13-15. Up next the Padres returned to Petco Park for a nine-game homestand, starting with the Washington Nationals on Monday. This is will be Tyson Ross’ first start at Petco Park since April 14. He’s taking on former SDSU star Stephen Strasburg.